Mind Stretching … Almost every time I hear the word Namasté, I am reminded of the scene in the movie Avatar where the Naavi acknowledge each other. They translate their words as “I see you”, but actually referring to an understanding beyond the visual. Such is the earthly translation we are given for Namasté; “I bow to you”, I acknowledge your existence, your spirit. The talented artists who have contributed to this collection bow to your physical and metaphysical health. 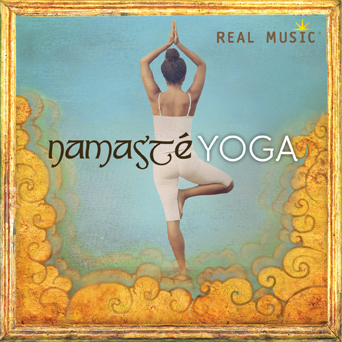 On Namasté Yoga, the fifth contribution to the Real Music Namasté Series, I was delighted with the nine tracks of peaceful, spiritually motivated music that is perfect for meditation, exercise, or just plain relaxing. The recording is aimed toward yoga sessions, but I am hesitant to say just yoga, as yoga to me is not only a form of structured exercise, but also a religion and a philosophy. In this case, I use the term for exercise in general. The recording has offerings by international, well-known artists Kiran Murti, Sacred Earth, Karunesh, Ben Leinbach, Buedi Siebert, and Rajendra Teredesai. On the tune “Abhaya Mudrâ,” Indian healer and artist Kiran Murti sings about the art of treating and prolonging life as he calls upon the five elements that make up the universe. Fire, Water, Air, Earth, and Ether come together in a chant for healing. Voice, sitar, and Bansuri flute blend together in an Ayurvedic elixir for the spirit. Murti’s voice is rather soothing. From Australia, Sacred Earth, a duo I am quite familiar with (Prem & Jethro Williams) presents the song “Guru Charanam.” It is unusual to hear Jethro sing, but on this one, his steady voice is at the helm until Prem joins him in the middle. The flute also plays a large part in a tune of what I think is about acceptance, about giving in to a Higher Power. As the elements come together, what holds them in concert is the sun. “Prana,” the song offered by German performer Buedi Sieibert, speaks about the energy or life force that holds all things together. Using a very artistic flow, what sounds to me like an electronic sitar and a dynamic sounding drone, he creates a very calming atmosphere. I am also acquainted with the artist Karunesh and I have reviewed him in the past. Karunesh invokes the spirit of the orient on the tune “Flowing Bamboo.” The evil spirits are chased away using bells in the opening of this haunting tune, but synthesizer and flute link up to cleanse the mental palate as the song carries on. This is my favorite on the album for having a balance of earthy organic and electronic sounds. American Multi-instrumentalist Ben Leinbach gives us the song “Khumjung”. Tucked into a remote area of Nepal, it is a region of chronicles, with rock walls and caves that bear witness to sacred history. Wooden flute and sitar drone guide on the climb, but then allow you to make your own observations. Rajendra Teredesai, one of India’s premier Bansuri flute players, blesses us with the tune “Shakti Dhyana.” His elongated, echoing notes are clear, almost pure. His melody meanders at times, but his path is evident. The result is a song that cajoles, summons, and invites the listener to begin her/his own quiet journey. All of the tracks on Namasté Yoga are soothing to one degree or another. Some offer a meditative theme, while others are calming and tranquil. Hidden in the music however, is something undeniable, some positive energy lurking in the shadows that is there if you will only reach out for it. Namasté.